When it comes to my beauty routine. I have to thank my cousin who used to be a make up artist for splashing me with water, cleanser, creams, moisturiser, and introducing me to everything you can find on a make up counter. I crave a dewier natural look when it comes to my skin and make up choices more over than, an all out make up look which I used to wear on stage during the stage school days. I drink a lot of water too. A girls’ beauty routine reflects her personality when it comes to make up. Mornings I find are the fresh start for my face and my inner wellbeing. I usually start my day with a good shower however, for my skincare I start my day off with Boots No7’s Beautiful Skin Hot cleanser. 2-3 times per week depending, on whether my skin needs a pick me up or my skin type changes due to seasonal weather, my mood, or because of pollution I use St. Ives Gentle Apricot Scrub. When using No7’s Beautiful Skin Hot Cleanser you gently massage the cleanser over dry skin ahead of, running the muslin cloth over hot water (not boiling) then use the cloth to swipe off the excess cleanser off. I find this leaves your skin smoother and healthier looking ahead of moisturising. For getting that pick me up St. Ives is great and quick if I’m heading out of the door. I apply the scrub a moisten face and neck and gently massage onto these areas. Then rinse well. (I find this product easier to use in the shower). Ahead of putting my make up on I use Nivea’s soft moisture cream pot which I use twice during my day. At the start and before I head to bed. This product last’s me for ages. For having sensitive skin, it really nourishes my skin due to the jojoba oil used in the product. Good for Your Teeth. Tea contains very high levels of catechin, an antioxidant that fights oral infections. Digestion. 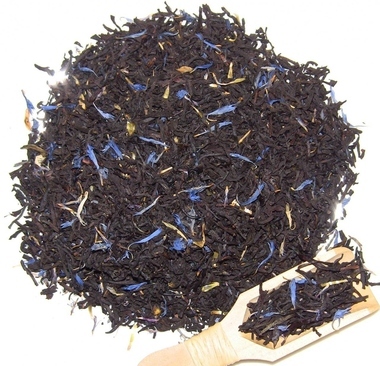 Earl Grey tea has been known to improve digestion. I drink clipper Earl Grey Tea which I discovered at University since I did not like the Breakfast Tea since, then I haven’t looked back since of drinking normal tea. For one concept if I’m not near an Earl Grey Tea bag I am still happy to have a cup of normal tea. After finding out these benefits of drinking Earl Grey Tea I would recommend to add it to your routine. In the evening I feel this is the most important part of your beauty regime. I keep this in a relax mood since this is the second to last step ahead of going to bed. The product I use in the evenings is Soap and Glory Peaches and Clean deep cleansing milk. Using Soap and Glory’s deep cleansing milk I find it just lighter enough to use after my skins day of pollution and other impurities such as make up. I love the science behind this cleanser which involves an organic complex that helps circulation and cell respiration and speeds up oxygen and nutrient to fight aging and re-energise the skin. This product is applied to my normal skin first using cotton pads then I rinse the cleanser off well. After using the cleanser, I follow up with my Nivea’s soft moisturiser and up to eight hours or more of sleep which is a recommend addition to your beauty routine. I try and get a good nights sleep every night. 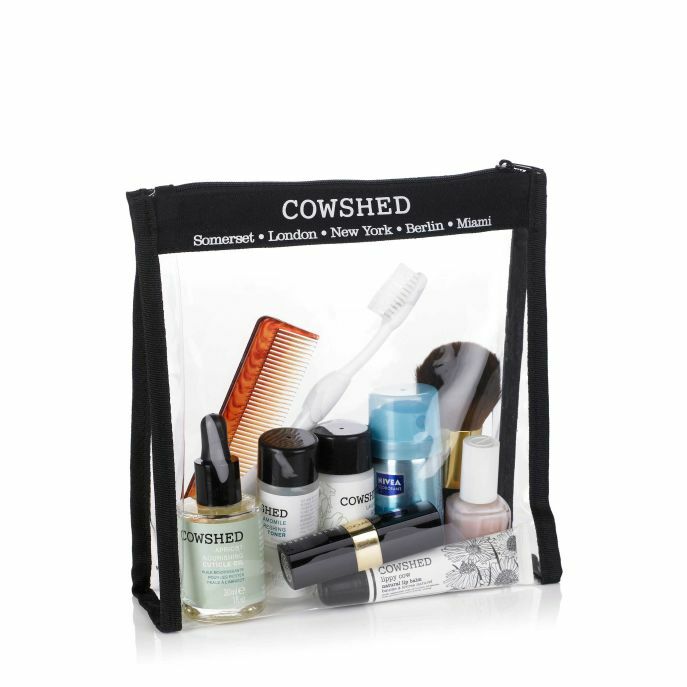 Cowshedflight friendly pouch is going to allow me to have simple refined amount of beauty things I need for my holiday. Which I find is great when you only have a limited bag allowance. The bare to dare body balm. After carrying out my beauty routine. 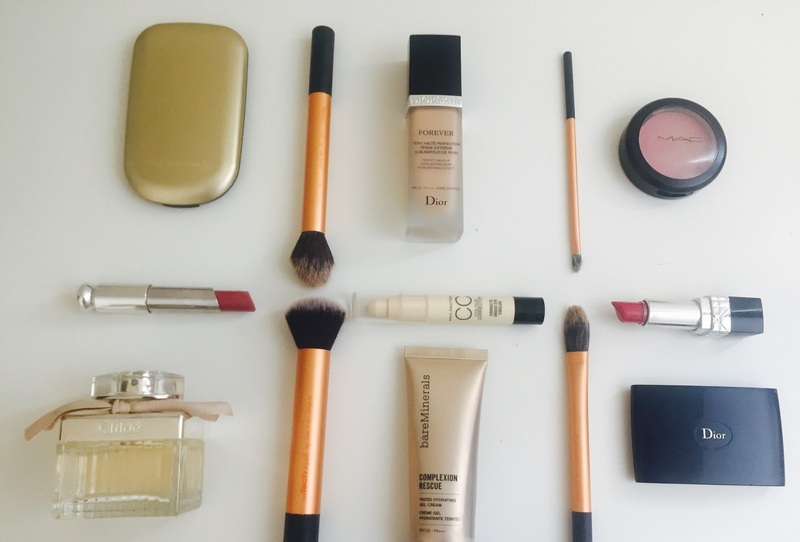 Here is what you can find in my Make Up Bag. 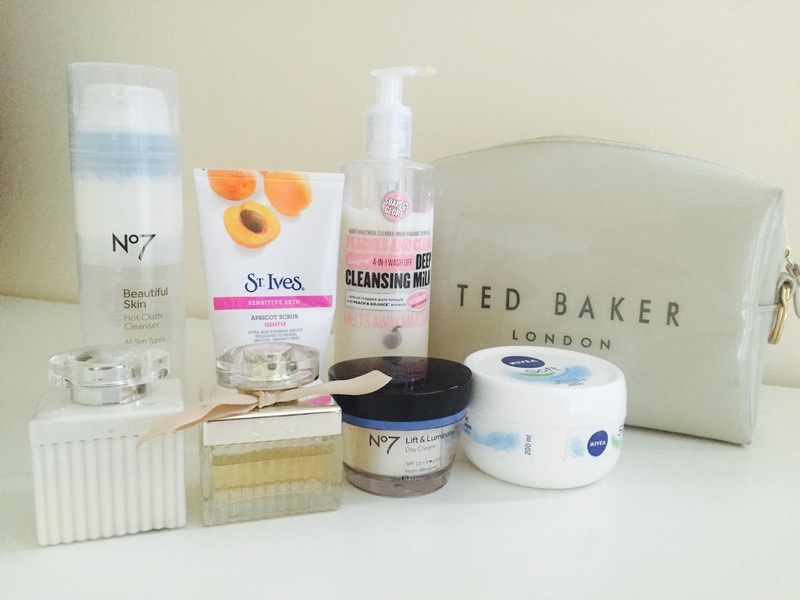 That's all my top skincare tips revealed! Enjoy trying out the Earl Grey Tea and other products featured in this post.